The flood that ravaged Lekki in August 2017 opened my eyes to a number of probable scenarios and I'll let you guys adjudge what you will from it. Firstly, the integrity of Eko Atlantic City needs to be thoroughly weighted. I came across a gif on Twitter which chronicled the progression of the sea city from 2008 till date. From the animation, you could see what used to be a large body of water, give way to parches of sand-filled topography and eventually, a settlement -- what has now become Eko Atlantic City. From the reports available on their website, it's likely more portions of the Atlantic Ocean will be dredged in order to allow for more land spaces. The remarkable feats which have been made possible due to profound works of engineering have also necessitated land reclamation from the sea in a coastal city like Lagos. And while it may be true that there exists large expanses of mangrove swamps in areas like Ikorodu, Epe, Badagry, all of which could be harnessed for human inhabitation, it is also pertinent to note that we can't hastily erode vegetation when science has made provision for alternatives. However, when those alternatives are hastily tapped (one of which involves dredging), we could be setting ourselves up for exponential disaster. Hence, depending on how you choose to look at it, this (dredging) decision is just as bad as it is good. For now. Secondly, Lekki is what results when science gets dumped by ferocious land-grabbers for solely selfish reasons. When you get to some parts of Lekki, you will be told that "Lagos is owned by 20 families, out of which three are periodically disqualified to make way for new entrants (families)." The core Lagosian will understand what that means, while an outsider will only be left scampering libraries for plausible explanations. To put things in perspective, the average Lekki landowner isn't interested in topography science, nor do they give an inkling about climate change and the plagues it brings. As long as money can be made from land sales and what not, then to hell with topography and drainage. The Lekki flooding is the ultimate result of the combustible reaction between human dirtiness, human selfishness and most importantly, human negligence. You can say what you will but Lekki/Victoria Island is yet to see the last of horrendous flooding. If the 2017 rainy season did not open our eyes to the derelict drainage system, let's hope that a tsunami doesn't come knocking. Trust me, we're not half as religious as Indonesia but look what happened in 2004. Lagos isn't even one of the world's top 20 cities at the lowest points below sea level but flooding has remained a behemoth plague with no remedy in sight. Thirdly, Dangote Group is building a new refinery - possibly one of Africa's largest - around Ajah and till date, no plans have been made to construct alternative routes for those living along that densely populated axis. Just in case you don't know the implications of this "oversight", introspect the infamous traffic snarl at Apapa which is caused by heavy duty trucks or "containers". A refinery that stands to produce 650,000 barrels of oil per day will not be loaded with taxis or scooters - there will be trucks, hundreds of thousands of them hauling petroleum products everyday. And unless these trucks will be airlifted to their various destinations in Lagos, we are likely looking at a traffic disaster starting from early 2019. We're a country that always fails to plan. ALWAYS. Lastly, one spark is all it will take for the citizens to turn the nation on its head. 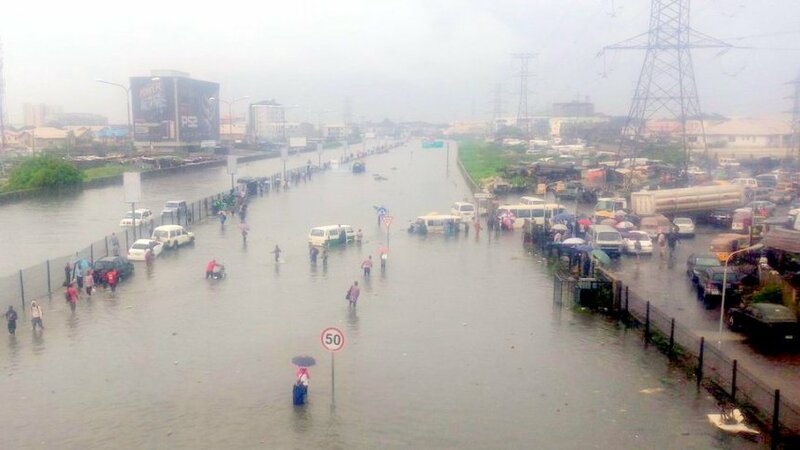 For those of you who plied the Lekki-Epe expressway in the wake of last Saturday's flooding, what did you notice? Did you see the number of people that dumped motor vehicles and walked the long stretch of the road instead? Did you see the agonizing traffic jam in which many were caught? Did you notice the anger on the faces of Nigerians who cursed government officials for not doing the single thing they were elected to do? Good. Clearly, I'm not the only one that observed these things. For now, let's continue pretending that things are working in Nigeria. Someday, the citizens will be forced to turn on their oppressors. And that day has never been closer. But for now, let's keep pretending.